The 10 Best Bike Shops in Rhode Island! Casual biker? Commuter on two wheels? Or maybe you’re more into extreme sporting? No matter what skill level you are, the experts at these Rhode Island bike shops will be willing to give you a hand so you can keep going the distance. Rent bikes from DASH, make repairs to your own bike, or purchase a new one from this fantastic one-stop store. If you’re renting, you can sign a waiver and pay all in under 15 minutes. Located in Fox Point, Legend is the go-to bicycle store for College Hill bikers. This no-nonsense store offers exactly what you need, and the employees take the time to explain all that you need done without being pushy or feeling like they’re overselling you. Located right on Wakefield’s Main Street, Stedman’s has been around for over 40 years. Though the bike shop still boasts the new name, the models just get newer and newer. Whether you’re headed in for a small tune up or to order a custom bike, Stedman’s will go the extra mile. Providence Bicycle has one of the largest inventories of bike’s you’ll see in a while. They carry a wide variety of accessories, including mountain gear and specialized equipment. Looking for a new bike? The helpful employees will be sure to know the best bike to fit your needs! Road bikes, hybrids, mountain bikes, tri-bikes—if you can name it, NBX has it! Located in a homey setting, you’ll immediately feel at ease at this local business. Looking for even more ways to work out your body than biking? NBX also boasts a hot yoga studio upstairs with classes offered daily. The best way to tour Newport is by bike. With great weekly rates, you’ll love exploring the little seaside city on two wheels. Even in an emergency, the owners will be right by your side to help you out on the drop of a dime! Owner Brendan isn’t like other bike storeowners. He’s not only in the business of biking, but the business of community building. He leads rides into Lincoln Woods on Wednesdays and offers all kinds of advice about bikes. You’ll love how connected you feel to the New England bike store after becoming a regular here. Ten Speed Spokes often offers quotes lower than other bikes stores around the area, but they’ll do just as fantastic of a job! The owners will make sure you have what you need to get back on the roads (or off) as soon as possible! Though this bike store is small, it’s packed with a great bike selection and plenty of unique parts to help you repair even the most obscure of bikes. Though they’re almost always busy, the staff will still scramble to get you the help you need in a timely fashion. 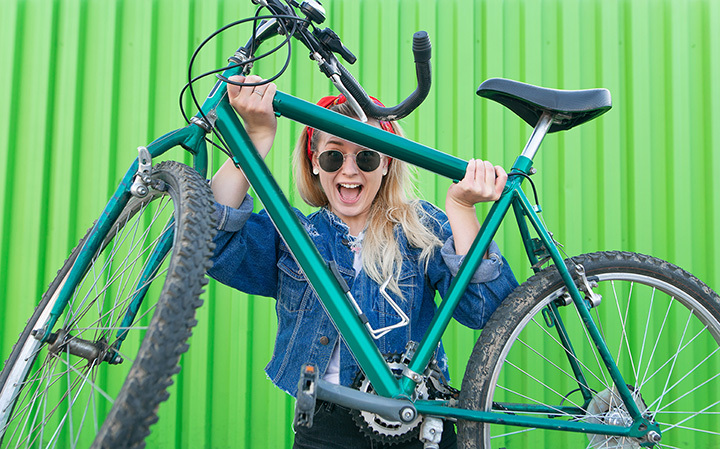 Recycle-A-Bike is a Providence nonprofit that allows people to buy recycled and refurbished bikes, build their own, repair your own bike, all while meeting new people equally as excited about bikes as you! Though the shop is only open on Tuesday evenings and Saturdays, you’ll love the help that this shop can provide!